Borage is an annual flowering herb with large, blue, star-shaped flowers that attract bees and other insect pollinators to the garden. The flowers can also be eaten as a garnish. Borage makes a great companion plant for most vegetables and fruit trees. 8-10 weeks to flowering. Each packet contains 40 seeds. Borage is an annual flowering herb native to the Mediterranean. This flower variety is open-pollinated meaning that you can collect the seeds from your plants and they'll grow true to type just like their parents. Borage leaves can be eaten, they have a slight cucumber-like flavour and can be added raw to salads or cooked like spinach. Younger leaves are best as they become hairy and fibrous with age. Borage leaves can also be dried and used as a herb. The flowers are edible and have a sweet flavour due to their nectar, they make delicious, colourful garnishes for desserts. Borage should be consumed in moderation as all parts contain small quantities of substances known as Pyrrolizidine alkaloids which are liver toxins. Borage flowers provide a nectar source for bees as well as the adult stages of many predatory insect species. Borage helps to repel a wide range of insect pests and makes a good companion for most plants including beans, brassicas, squashes, fruit trees and strawberries. The scent of Borage confuses the adult moths of the tomato hornworm and prevents them from laying their eggs so planting it around tomatoes can be particularly beneficial. Borage is not thought to inhibit the growth of any other plant species. Varying preparations made from Borage have been used in traditional herbal medicines to treat a wide range of disorders. 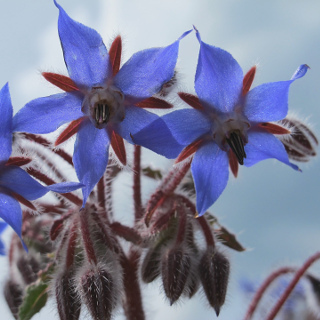 Borage is grown commercially in some countries for their seeds from which an oil used in herbal medicine is extracted. Borage prefers growing in full sun but will also tolerate light shade. Borage require a well drained soil, grow it in raised garden beds if your soil is too compacted or heavy with clay. Dig through lots of organic material including well rotted animal manures, compost or worm castings to improve your soil structure and provide your young Borage plants will all the nutrients they need to succeed. Fertilise monthly with a complete organic liquid fertiliser, worm juice or compost tea for best growth. Borage will grow to almost a metre tall before flowering if soil conditions are good. Borage will die off as the weather cools but will self sow and re-emerge as the weather warms if growing conditions are favourable. Remove the flowering heads from your Borage plants before they set seed if this is a problem. Water Borage plants regularly but not so often that the soil becomes constantly damp or they will rot, allow the soil to become dry to the touch between waterings. Borage will grow in soils of a wide pH range but grows best in a soil with a pH between 5.5 and 8.0. Mulch around Borage plants to suppress weeds. In cooler and temperate regions of Australia sow Borage from September to February. In subtropical and tropical regions of Australia sow borage from September to May. Sow Borage seeds 7mm deep spacing plants about 35cm apart. Most Borage seedlings will germinate 7 to 12 days after sowing. Borage will grow quickly if conditions are favourable, taking between 8 and 10 weeks to begin flowering.